The Nursery is Officially Done! Well we have two weeks until Kanan is due to arrive. I’m finally off of work so I can put my feet up (when I’m not nesting like mad!). My 38 week check up shows no progress so far at the signs of labor, so I just might have to figure out more things to do as I wait. One of which, has been finishing up Kanan’s room. Click here to view the photo album of his room. It’s narrated, so just double click on each picture and you will get the narrative and then you can scroll through at the speed you wish. If you do slideshow, it might go too fast for you to read the captions. Thanks so much to everyone who has spoiled Kanan with gifts whether you were at the nursery or gave your gift in private. We could not have done this without you. I tried to set up the nursery so that pieces of all of you are everywhere. Whether you are in the decor or in his closet or dresser–your love is present and felt strongly in the room. Sometimes I just hang out in there because it just feels so full of love. 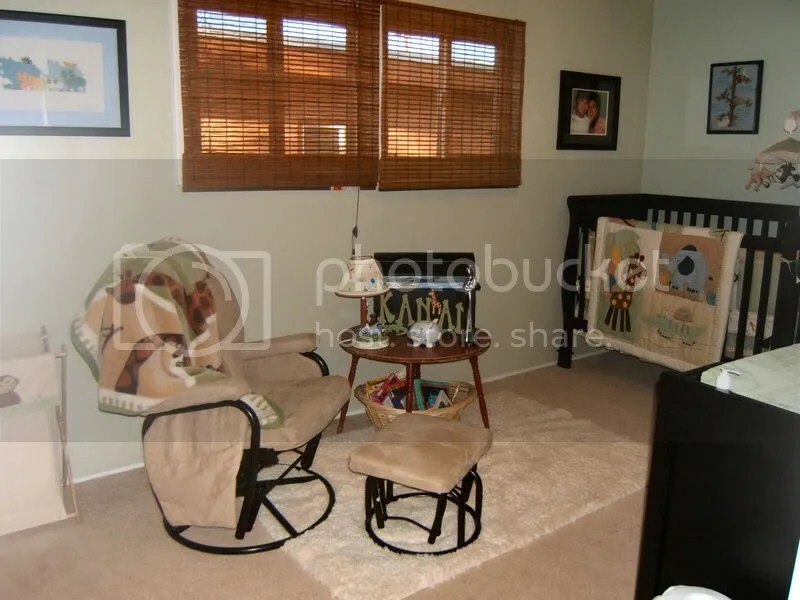 Theresa- Your nursery is so warm and inviting! I’m sure little Kanan will love it! There are lots of memories to be made in this room!